Although they can save prep time, vocabulary worksheets are not the best way to teach vocabulary-- by themselves. However, they can be a useful part of an integrated vocabulary lesson. Reading or hearing a newly-learned word several times and using it in various ways helps a student retain the word. That’s the reason the worksheets on EnglishHints.com almost always include links to reading and/or listening activities and often discussion ideas and games as well as practice using the new words. Teach English with Spanish-English Cognates is now on its own page, unlike the pdfs above, which are on this page. The academic English vocabulary worksheets on this page are designed for middle-school through adult intermediate ESL students, though many high beginners (or native speakers) could use them. There are also some advanced vocabulary worksheets on Free Printable Worksheets. The biggest difference between the intermediate worksheets on this page and the advanced ones on the Free Printable Worksheets page is the amount of vocabulary practiced on a page. The advanced worksheets also include some less common upper level Academic Word List vocabulary, while all the vocabulary practiced on these worksheets is very important for students to understand. A major advantage for teachers is that these packets already include reading and often writing activities for integrated skills practice. This may be especially valuable if you don’t have access to a good textbook or many supplementary materials. A variety of activities and games suggested also allows you to differentiate instruction, providing a review for your quicker or more fluent students and more practice to students who need it. 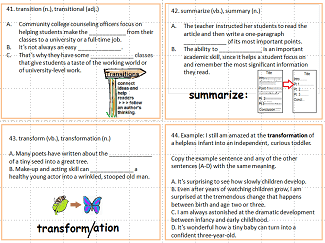 Most of these worksheets are in packets in which later worksheets review earlier vocabulary. Most worksheets teach ten to fourteen tier two academic word families (interact, interaction, interactive, etc.) each, along with some occasional related vocabulary students likely already recognize. 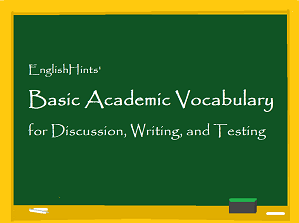 I chose the basic academic vocabulary emphasized in these worksheets from Coxhead’s Academic Vocabulary List (AWL) and important academic vocabulary lists from Marzano Research, Berkeley Unified School District, and a number of teachers. The vocabulary ranges from basic words like compare, demonstrate, and examine to harder words like abstract, bias, categorize, strategic, etc. Every worksheet has multiple ways to practice the essential words it teaches, along with ideas for presentation, classroom games, and assessment. This simple explanation of science vocabulary and the scientific method will help your students recognize important academic vocabulary and understand science and psychology news and research. This packet is designed as a reading activity and discussion starter. Ask students for their experiences doing experiments and solving problems. Did they follow a similar procedure? What did they do differently? What were their results? What steps do they consider the most important? The quiz makes a good short review (or warm-up) for later in the week. 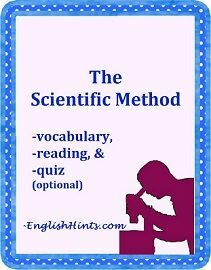 To download the Scientific Method Packet, click the button below. It’s important for English Language Learners to fully understand the words used in writing instructions and test prompts so that they know what they are expected to do. Understanding basic academic vocabulary will also help reading comprehension and class participation. The lessons in this packet show the ways about 30 important verbs (and related nouns and adjectives, as well as a few lone nouns or adjectives) can be used. The words appear first in short texts about essay writing. They are practiced multiple times in example essays, task cards, and a crossword so students can see them in different contexts, use them themselves, and have a chance to really acquire them. analyze (including analysis & analytical), conclude/ conclusion, determine (etc. ), evaluate, identify, interpret, predict (all from the Scientific Method essay, as well as bias, evidence, and valid from its glossary– not on cards). The most basic verbs for instructions, in “Sharing Ideas”: demonstrate, explain, illustrate, describe, respond, integrate, develop (and in comparison essay) compare, contrast, similar, distinguish. These lessons can help ELLs ease into essay writing, with some explanation of what is expected in an essay in English, then several example essays, practice with transition words and proofreading, before they need to write themselves. Some of the Common Core standards addressed: CCSS. W8, 2 & 2c., 8.5, 9-10.2c & 5; L.8.4a, & L.9-10.4a. Download it now for $12.50. If you don't need the task card vocabulary practice, you can get the rest of these lessons (which demonstrate the vocabulary but don't give all the word forms and gap-fill practice) in Basic Essay Vocabulary (for Classrooms) on the English Essay Writing Practice page for $8.00. 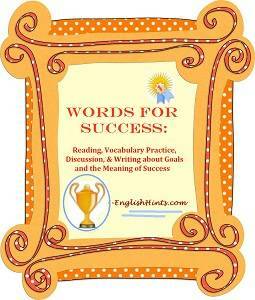 Words for Success: Reading, Vocabulary, Discussion, & Writing about Goals and the Meaning of Success. 3-5 days' worth of lessons on goal-setting, goal and achievement vocabulary, and integrated reading (and possibly listening/watching), discussion, and writing about success, failure, and what's most important in life. The suggested readings (linked) are commencement addresses discussing the meaning of success and the value of initial failure. The key address is in clear. simple language. You can check out the online version of much of this content at Reading Comprehension Questions and the linked pages at the bottom of that page. Click the button below to download Words for Success for $6.00. 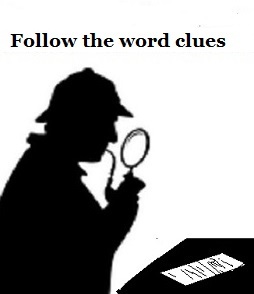 See Reading Comprehension Lesson Plans for Word Detectives and the Word Detective bundle, which both teach a lot of academic vocabulary as well as reading skills and some roots and prefixes. We also offer root, prefix, and suffix practice at Suffix Worksheets. If you’re interested in online vocabulary practice, see Vocabulary Games and Activities. Home > ESL Worksheets > Academic Vocabulary Worksheets.